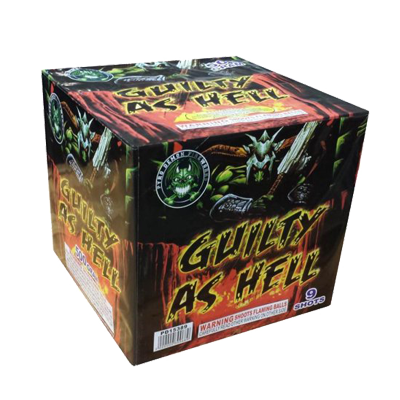 Guilty As Hell – An enormous display of alternating brocade crown and silver chrysanthemum to crackle with a 3 shot finale that will leave you feeling guilty as hell. 96 Shot Color Pearl Flower - 96 Shots of bright and colorful pearls and stars. Crackling Thunder - Gigantic bursts of silver coconut; red coconut; sky blue with white glitter, green glitter and silver chrysanthemum; silver coconut and sky blue; lemon, green and loud shock waves of silver chrysanthemum; ending with sepctacular loud crackling time rain. Desert at Night - 7 Multi-colored shots ending in color bursts. 3" One Bad Mother - Huge shots of alternating gold willow with multiple blooming crackling flowers enhanced with gold willow followed by quickened final 3 shots. Cover Yo Ears - 7 Shots of white sparkler, green sparkler & crackles. Chili Pepper One Hot Mama - 20 Shots of golden tails lead to alternating red & green coconuts. Adults Only - Green tail to whistle, red tail to red star white glitter. At It Again - 9 Shot of green tail, purple green glitter, blue tail to blue star with gold glitter, silver tail palm with report.